On Monday, June 18, the U.S. Senate declined to take a vote on the Egg Products Inspection Act Amendments of 2012 (S. 3239) The bill is pending in the House and may still come up for a vote. It is believed by congressional experts that the bill has only a very slim chance of being passed into law. The presence of the bill in congress does serve the purpose of highlighting the plight of the 300 million or so chickens who currently live their lives confined in battery cages in the U.S.
Two – Provide for humane euthanasia – current methods are extremely inhumane. Three – Require perches and nesting spaces. Four — Require labeling that reflects that actual conditions in which the hens are kept, such as “free-range”, “cage-free”, “caged”, “enriched cages”, so consumers of egg products can make informed choices. Five – Prohibit withholding of food and water, which is currently employed as a method of increasing egg-laying production. Six – Require improved air quality. One of the most controversial aspects of the bill is that it would pre-empt any state or local regulations, present or future, which would require more living space for each egg-laying hen, thus effectively forestalling any further legislative action to give hens more space. 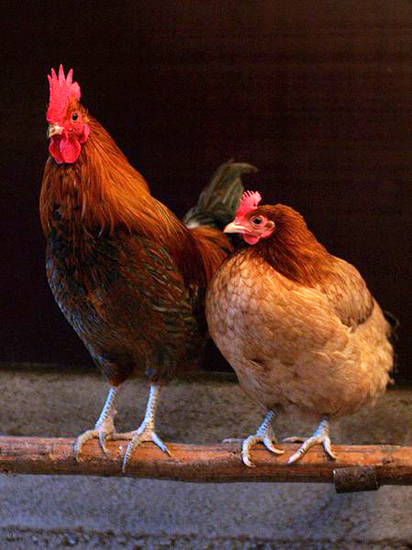 No future laws could require hens to be given more space or to be free-range. The cruel system of factory farming with battery caged hens would be enshrined in federal law in the U.S. for the foreseeable future. Battery cages could not be banned in years to come. On other hand, the bill’s supporters argue that the likelihood of battery cages being banned in the U.S. any time soon is around zero, so any improvement, even if minimal, in the lives of the hens would be a good thing. A view from Animal Rights. About.com, click here. A view from Animal People Online, click here. A view from United Poultry Concern, click here. Photo: Andrei Niemimäki from Turku, Finland / Wikimedia Commons / “This file is licensed under the Creative Commons Attribution-Share Alike 2.0 Generic license.” / A rooster and a hen. A couple delighted with their puppy. 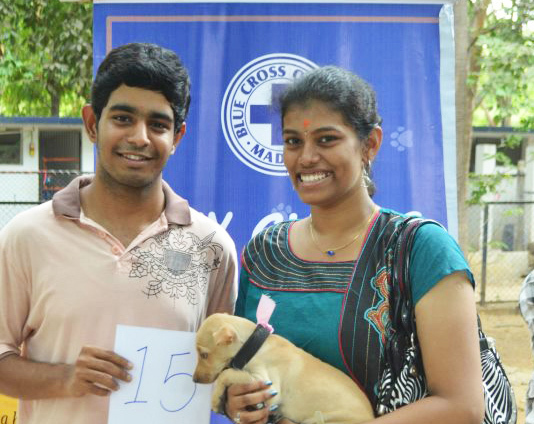 Blue Cross of India held an Adopt-a-thon the afternoon of June 17 at their main shelter in Chennai. To read the article in The Hindu about this event by Sriya Narayanan, click here. Waffle with her new person, Pavithra Ganashyam. Waffle found her home with Pavitha Ganashyam at Let’s Live Together’s most recent puppy adoption camp in Bangalore. “Let’s Live Together is glad to announce that we are back with our monthly puppy adoption camps at Sankey Tank with a BANG !! 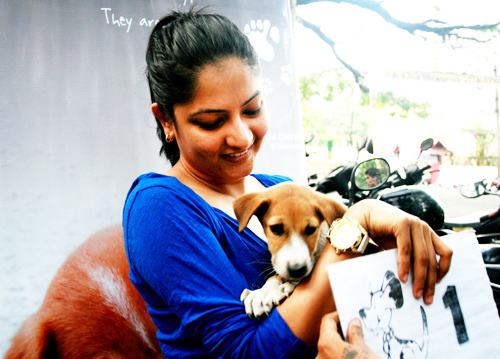 The 10th of June witnessed our 22nd puppy adoption camp at Sankey Tank which was met with a warm response. Eleven gorgeous Indian puppies bid farewell to their lives on the street and embraced their new families who couldn’t wait to give them the love and attention they deserved. Pedigree as always has been our constant support, and we are extremely thankful to them for having provided gift bags to all the adopters. A dedicated bunch of volunteers played an important part in making sure the camp ran smoothly from early in the morning till late in the evening.